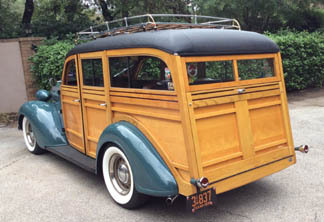 '38 Plymouth Westchester Suburban belongs to furniture shop owner Jim Cuny. 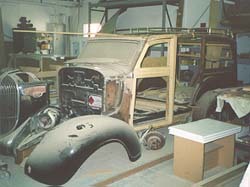 Most of the wood is being replaced and fabricated in the furniture shop. 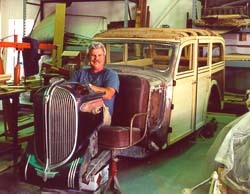 Happy owner Jim Cuny is anticipating completion of the car and trying out the chauffeur's seat arrangement! New door panels are cut from book- matched maple plywood. 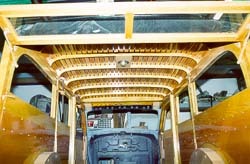 Roof headers and all top bows are attached. 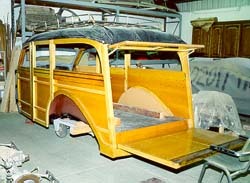 New tail and liftgates were made as well as corner posts, bottom tailgate/hinge mount board and fender contour ends. 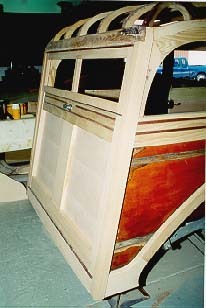 Contrasting wood strips added to beltline areas of doors, tailgate and quarter panels. 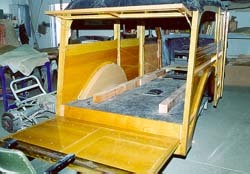 New quarter panel plywood is also being made from same bookmatched maple as door panels. 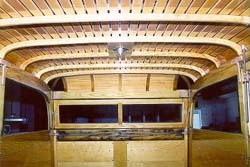 New basswood slats are made in shop and installed. 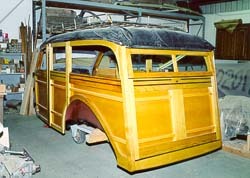 Plymouth had short narrow slats create curve at rear roof area over liftgate. 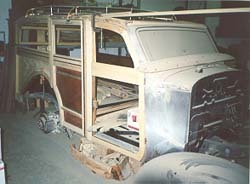 Looking toward the front, all internal brackets are painted and installed. New stainless screws and washers are used throughout. 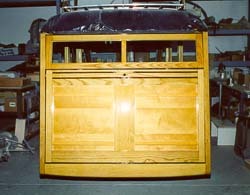 After final varnishing, the doors are rehung along with the liftgate and tailgate. Liftgate and tailgate hardware is being added at this stage. Tailgate has dark inset wood strips along the beltline to match the sides. The body is nearly complete and awaits a reunion with the refreshed chassis. 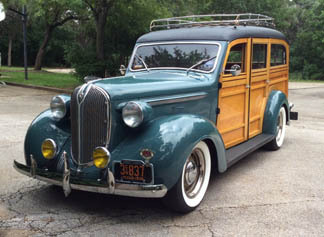 After a move to Texas, the owner finally completed the car, after a long and enduring process. The car looks good after too many years of staorage and false starts.